I didn't vlog much during Ramadan but I did on the first day, so decided to include it in this vlog. It was also Anjali's birthday and some of us went out to eat 2 days in a row. On Anjali's actual Birthday, it was at Moghel Tandoori (they have 2 locations but we went to Longueuil one. Anjali is obsessed with the TV show "Devious Maids," so her sister ordered a cake that represents the show. 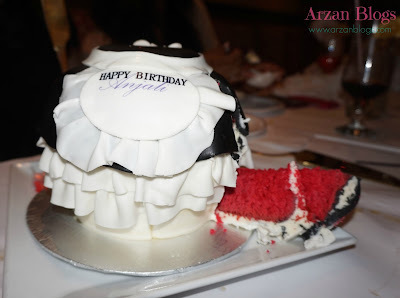 Inside was red velvet (our favorite). As always, the cake was custom made by Les Glaceurs. Next day, we went to Fenêtre Sur Kaboul but I didn't vlog much but that's one of our favorite restaurants. We're obsessed with their Shir Yakh (homemade ice-cream).